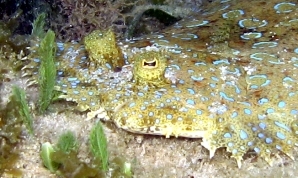 Unlike other flat fish, like stingrays, that lie on their stomachs, flounders lie on their side, flat as a pancake, with both eyes on the top-"side" of their head. Flounders are not born this way, however. The young swim upright, just like other fish, with one eye on each side of it's head. As the fish matures and starts swimming sideways along the surfaces of the sea floor, the bottom-side eye slowly migrates over so BOTH eyes end up on the "top-side" of it's head. Juveniles can be found in water as shallow as 2 feet in areas of sand, rock and rubble. They will lie motionless, relying on camouflage and only move when feeling threatened. Then they will swim away in a wave-like gliding motion over the bottom, only to stop again a moderate distance away. Fish in shallow water will be in the 6-10 inch size.